A Chinese scientist who claims to have created the world’s first genetically edited babies said at a conference on Wednesday that his actions were safe and ethical, and he asserted that he was proud of what he had done. But many other scientists seemed highly skeptical, with a conference organizer calling his actions irresponsible. “For this specific case, I feel proud, actually,” the scientist, He Jiankui, said at an international conference on genome editing in Hong Kong. Indeed, the only thing Dr. He apologized for was that news had “leaked unexpectedly” that he had used the gene-editing technique Crispr to alter embryos and then implanted them in the womb of a woman who gave birth to twin girls this month. Or maybe it didn’t happen. How many times have we fallen for cloned baby hoaxes? On the other hand, even if this isn’t the real thing, it’s bound to happen eventually, and it’s bound to happen in China. The West, in spite of our massive intellectual capital in genetics, is unlikely to ever do more than play catch up to the East which doesn’t have the western hang up of “but Hitler,” to stifle every development in genetics applied to humans (and to stifle about every policy argument). On the other hand, the West has a lot of other hang ups that will make further practical scientific advancement impossible. We can build great rockets, but while we’re arguing over fitting 52 different bathrooms on it to handle the multiple genders, the Chinese will simply colonize the solar system with just two bathrooms. So China it is. In this case, the Chinese team disabled the CCR5 gene, to confer resistance to HIV, Smallpox, and Cholera. It’s a naturally occurring mutation that appears in some Northern European populations, and recreating it in the embryos of families where the fathers are infected with HIV (as this study claims) seems like a win/win. So if these trials, and by trials I mean the two baby girls, are a success, what other CRISPR additions could be added? How about a healthy copy of BRCA1? A mutation of that gene leads to ovarian cancer in families, and the chance to eliminate it would allow many people to live without a heavy predisposition to cancer hanging over their heads. A mutation of GLP1R protects against Type II diabetes. The MSTN R allele confers greater muscle mass and is found among high performance athletes. A gene carried by a Papua New Guinean tribe that confers resistance to dementia. The Bajau people of Southeast Asia have a variation of PDE10A, which gives them spleens twice the “normal” size. Why does that matter? The Bajau can hold their breaths for up to 13 minutes at depths of up to 200 feet. Actually I could go on and on listing the many local adaptations that have appeared in populations around the world: Lactose tolerance is probably the best known, but there are others such as high altitude adaptations, and malaria resistance. All of those genetic adaptions could be up for grabs and available to anyone willing to travel to the East for a clinic that preforms such genomic surgery. It’s sure quicker than the old fashioned natural selection way. Of course, the real prize would be multiple gene qualities like high IQ. The ability to add a few IQ points to embryos will give whatever countries allow it a significant boost; one that would be nearly impossible to catch up to. I wanted to take some time to take in the results of the mid-term elections before I came to any sort of conclusions since immediately afterwards there is a lack of real data, and in this election, lack of real election results. However I finally set down to note a few thoughts on the results. The turnout for this midterm was unprecedented, with 113 million people voting, compared to 83 million in 2014. My prediction on the GOP winning the House was based on the assumption that the Democrats would not be able to do much to increase turn out in a midterm election. That has been a constant problem for the Democrats, allowing the Republicans to play catch up on those off year elections with no President at stake. This time however, the Democrats finally cracked the turn out code, by another tactic that I’ve consistently underestimated; the ability to keep the outrage at Trump’s election turned up to eleven more or less consistently since November 9, 2016. If they can bottle this it’s a game changer, and bad news for future Republican prospects. California: One thing I did anticipate is that I didn’t see much chance of retaining most of the GOP seats in California, especially ones in which a Republican incumbent was retiring. 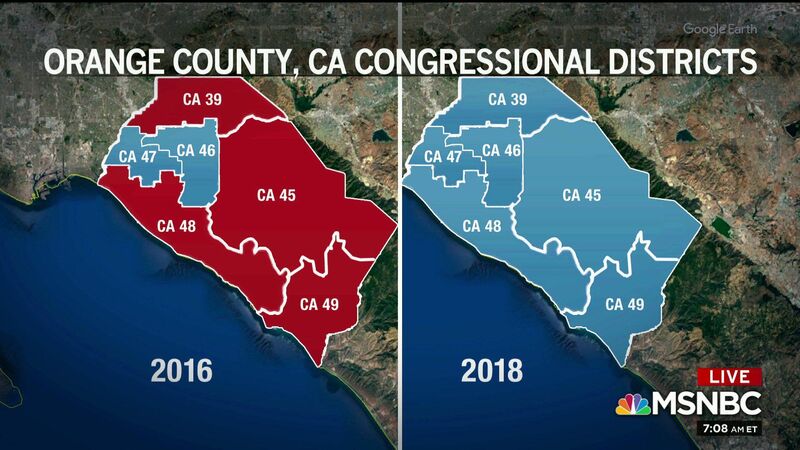 Daryl Issa’s district, CA-49, was a good example. He won his 2016 re-election by one percentage point, saw the handwriting on the wall, and retired this term, leaving the seat to be won by a Democrat. Ohio: On the other hand, Ohio is moving (albeit slightly) in the other direction. The big national news about Florida was all about two corrupt Democratic counties still being corrupt Democratic counties and trying to redo the election post voting, however that was just a minor snag. To me the real story is that the Democratic Candidate for governor, Andrew Gillum, the corrupt mayor of Tallahassee, under FBI investigation, with the baggage of Bernie Sanders style socialism, plus the promise of massive tax increases, only lost by 33,683 votes, 49.18% of the vote to DeSantis’ 49.59% of the vote. It’s a stark example of where the Democratic Party is right now; comfortably abandoning any pretense of moderation and fully embracing what was radical yesterday as the new party mainstream. This seems to be a telling portent for the future. Whoever the 2020 Democratic Presidential candidate is, chances are his or her positions will resemble Bernie Sander’s far more than Hillary Clinton’s. And Democratic and Independent voters won’t be scared away by that. The Republicans, if they were smart, would start strategizing how to deal with a radical opponent in which possibly a majority of the electorate shares and supports those views. Unfortunately, the Republicans aren’t smart and will probably only start thinking about that after Election Day in 2020.